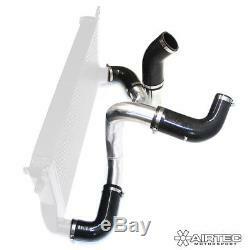 AIRTEC Motorsport big boost pipe kit for the MQB EA888 platform used by VW, Seat, Skoda and Audi Designed to increase power and torque figures by replacing the standard restrictive boost pipes and improving flow. With larger internal diameters, less restriction means a smoother air flow and an increase of power. Smooth larger, mandrel bent hard pipes supplied with Pro Hoses silicone hoses from the turbo outlet to the hard pipe, the AIRTEC big boost pipe kit is designed as a direct replacement of the OEM parts, eliminating restrictions found on the stock charge pipe while allowing enough clearance from engine parts, increasing performance in the process. PLEASE NOTE: Intercooler NOT included, big boost pipe kit ONLY. Supplied with new stainless steel jubilee clips. 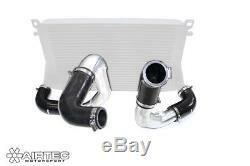 Will fit the following vehicles: Audi A3 8V 1.8/2.0 TSi Audi S3 8V 2.0 TSi Audi TT and TT-S Mk3 2.0 TSi Seat Leon Mk3 1.8TSi and 2.0 TSi inc Cupra Skoda Octavia Mk3 1.8TSi and 2.0TSi vRS VW Golf MK7 / All road / Sportwagenn 1.8TSi and 2.0 TSi VW Golf Mk7 GTi / R 2.0 TSi OPTIONS Pipework Finish Motorsport Satin Silver Pro-Series Black Silicone hose colour: Gloss Black, Frozen White, Performance Blue, Race Red, Bright Yellow, Grey, Kawasaki Green, Orange, Vivid Pink, Purple. Please note all colours are made to order, however all colours except black, blue and red are SPECIAL ORDER and are NOT returnable if you change your mind. The item "AIRTEC Motorsport MQB EA888 platform big boost pipe kit VW SEAT SKODA AUDI" is in sale since Wednesday, October 3, 2018. 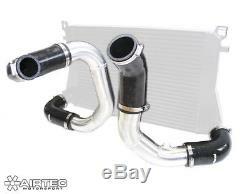 This item is in the category "Vehicle Parts & Accessories\Car Tuning & Styling\Air Intake & Induction\Hoses, Ducts & Fittings". The seller is "rmsoutlet" and is located in South Woodham Ferrers. This item can be shipped to United Kingdom, Austria, Belgium, Bulgaria, Croatia, Cyprus, Czech republic, Denmark, Estonia, Finland, France, Germany, Greece, Hungary, Ireland, Italy, Latvia, Lithuania, Luxembourg, Malta, Netherlands, Poland, Portugal, Romania, Slovakia, Slovenia, Spain, Sweden, Israel, Hong Kong, Norway, Indonesia, Malaysia, Mexico, Singapore, South Korea, Switzerland, Taiwan, Thailand, Saudi arabia, South africa, United arab emirates, Ukraine, Chile, Australia, Canada, Brazil, Japan, New Zealand.